Two years of research. Two years of talking to the top recruiters, the real HR experts and the people who have successfully landed their dream job. 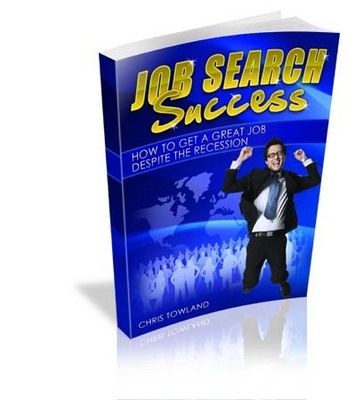 Two years gathering the top job search secrets now available to you today in this 160 page book and available for instant download to your computer. Job Search Success has been a fantastic help for me throughout the job seeking process. One thing you will find when youre trying to put together a CV is that so many different websites exist on the Internet, which are all trying to give you different advice. Instead of wasting time searching different sites, this one book can do it all for you. Its detailed, precise, well laid out, and thoroughly covers all aspects of the job seeking process. What is particularly useful is that the advice throughout the book is supported by actual examples in the annexes, where you can find sample CVs, cover letters, speculative letters, and even phrases suitable for your profile. Job Search Success has helped me to confidently construct a CV, and several employers have told me how impressed they were by the content and layout of it. Getting a new job is a job in itself. As youre actively looking for help in finding a new job as youve found this page youre clearly serious about doing it a better way. But it can be fun if you treat it as a challenge one you can win, with our help. Our new 160+ page book which is available for instant download here, today takes you by the hand around the UK jobs market. Forget stories about the recession yes, theres pressure on jobs, but you need to know how to successfully cope with this- and use it to your advantage. Weve all heard about the lucky people, who have / get good jobs. But its not about luck its about work. To get a job, you need to work at it and if youre not prepared to work at getting a job, well, youll never get a job simple as that! Im Chris Towland and for 2 years Ive been interviewing, cajoling, pestering and otherwise bothering HR consultants, recruiters and successful job applicants to find out the real secrets to success in the business of Successful Job Searching. Im now ready to share these secrets with you . Heres some of the insider secrets youll learn secrets that your fellow job-seekers arent even aware of let alone using! Lets start with 3 amazing ways to improve your CV with no lying, no cheating, nothing underhand in any way whatsoever. 1) How to use a simple piece of card approximately 3½ x 2 inches can get you in the door to a job that many other job hunters never get to know about (page 34). 2) Why you must have 2 email addresses to be successful at job hunting youll slap your head in amazement when you see the power of this (page 22)? 1) the THREE things you must never, ever do at interviews. More people lose jobs through these simple, but not obvious, errors than youd have ever realised. 4) 7 tips for using magic words magic words which add astonishing power to your CV making it really stand out from the others - pretty much guaranteeing you the interview and the job! (page 121). 5) A nice little tip for reclaiming your travel expenses - as ever, totally legitimately, of course! (page 93). 6) Our favourite tip how to get around 2,500 people (mostly strangers!) to help you find out about the massive number of hidden jobs (page 63)! But remember, its still not easy which is why we have included even more in this over 160 page book on getting UK jobs. Even in a recession some companies are taking on more staff. We give you a list of the ones which employ the most with a direct link to their actual website recruitment pages (pages 132 to 145). There are certain things that really put interviewers off - within the first few seconds of meeting you. We tell you what they are so that you can prepare beforehand and not get caught out. (page 168). Potential employers love to hear that you are making real use of your time whilst you are job hunting. What better way than to update yourself using free resources or get yourself on a free course? It impresses the life out of recruiters and makes you stand apart from the other applicants! (page 75 and 147). You may just need some assistance in getting, for example, a new suit for your interviews. Find out about a little-known grant that will pay towards the cost (page 89). When you are out and about, there is a free resource which allows you to receive voice mail and faxes from prospective employers - without actually using a fax machine or telephone! (page 19). Putting your CVs and letters together requires a decent word processing application. Microsoft Office is obviously the best choice but see how to get a free Microsoft Office compatible software - totally legally (page 20)! Looking for obscure jobs can take up a lot of time to discover. Find out how to get as many as 2,500 people to help you find your next job (and yet most of them are probably strangers) (page 63)! Where can you find jobs that most people dont hear about. Some successful job hunters have caught on to this but are unwilling to tell you because, understandably they fear more competition (page 67). The book shows how local councils give clues to where new jobs are likely to crop up .. and yet, astonishingly, they are probably not aware of it themselves we reveal all (page 65)! Interviewers like to see some evidence of what you can achieve and yet most job hunters dont bother. Find out how to put together a powerful portfolio which really does create a great impression on the HR departments recruiters (page 36). You can influence the interviewers decision on whether to employ you with a simple letter which most other job hunters dont even consider taking with them. Find out how to create this letter (page 51). Some company websites email you when a new job is available. Others display vacancies but dont email you. We share a neat little secret but easy technique which automatically finds out when employers put up new job listings - without you having to return to their website every day to check (page 73). Murphys Law comes into play when going to an interview. If anything can go wrong you can almost guarantee it will unless you allow for this. Combat pre-interview emergencies with an amazingly impressive (and pain-stakingly created) short-list of things that will rescue you from a bad first impression. Weve done this work, so you dont have to. (page 86). So...Whats All This Information Worth? Because you see...This isnt some off the wall rapidly pieced together eBook! But best of all...Job Search Success is written in plain, easy to understand English (This means that you wont find any super complicated technical jargon here) - Its written to be dead-easy to read and understand, and its laid out so you can easily follow it. Yes you read right...Thats just a fraction of what its really worth and the cost to put this eBook together (Countless hours interviewing experts, doing research, and double checking to make sure that the information included is the most cutting edge up to date information there is). Information that will put you way ahead of other job seekers. Why am I making this so affordable? Simple, because you see...Since its a digital eBook my costs to deliver it to you are small compared to if I had to actually print it out (Which would raise the cost to around £34). That means that you can get your hands on this latest cutting edge information about finding a job in a recession and be reading it within less than 5 minutes. Very soon I will have to raise the price. This will happen as soon as Ive had time to add a few more testimonials. Yep...I will raise the price to £27 or more, and honestly I have to - Because the demand is growing so fast. So if you want to order now you can save yourself some money and be one of the first to use these insider techniques in your area. Just think what an advantage that gives you over other local job seekers. Job Search Success is available for just pennies on the pound considering what the value of a great new job will be to you and your family. For just £16.97 youll get all the insider techniques you need to put you streets ahead of other uk job seekers and get you the job you deserve.